AGL responds to the concerns raised by the local population of Khulo and Shuakhevi municipalities regarding reduction the number of fish in Adjaristsqali river. Herewith, we would like to explain that our company has been conducting research and monitoring of river habitats, in particular fish and water micro-invertebrates since 2013. Monitoring has been conducted on 15 stations 4 times a year during low and high flood periods. Monitoring covers desktop analysis, field surveys, laboratory processing of the found materials and anamnesis. 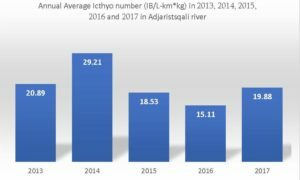 Based on the monitoring results we can say that at this stage significant changes in the structure of fish population of the Adjaristsqali river has not been noted. The difference between the data of 2013-2017 is within the annual fluctuation of the rivers typical for the Kolkheti Mountainous rivers. It should be highlighted as well that the Shuakhevi hydropower project has not been into operations yet and consequently the project cannot have any impact on the reduction of the number of fish.